Pink shirt day against bullying and we made a pink shirt! Were you ever bullied? I know it sounds CrAzY, but I only realised about a year ago that I was bullied in grade 7. I know - how didn't I know???!!! It lasted about a year and it wasn't so onerous that it interfered with my day-to-day life. It just became part of my daily routine - pack up my school books and then run the gauntlet home. For the entire winter T would be waiting for my friend S and I. We'd try to outrun her and she'd catch us, fill our toques* with snow, push us in the snowbank, dump our books out and then leave. We'd brush ourselves off and go home. This was before ANY awareness of bullying so it never even once crossed our minds to tell our parents or a teacher or another adult. It just was something that you put up with. T went on to high school and the bullying ended. Luckily things have changed. Today is pink shirt day at the girl's school. 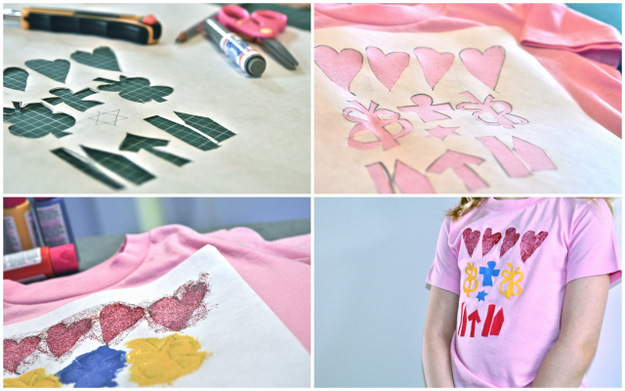 Rather than a store bought shirt, I thought we'd do something quick and crafty. A drawing by the girl, some freezer paper, some fabric paint and she was ready for school today. Easy and quick. So say no to bullying!